Info "Catch the falling Fronk!" Oopsy-Daisy is one of Fronk's microgames in WarioWare: Twisted! 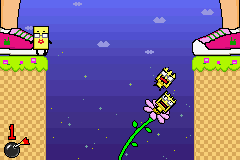 The player will control a Fronk on a flower. When the game starts, another Fronk will be standing on a high ledge. A foot will shake the ground and make the Fronk fall from the ledge. The game's purpose is to catch this falling Fronk by tilting the flower. 1st level difficulty: The Fronk lands on the close side of the ledge. The place is set in daytime. 2nd level difficulty: The Fronk lands on the far side of the flower. The sky has a sunset color. 3rd level difficulty: Two feet kick two objects off, but only one of them falls. One is a creature that resembles a Fronk (the one that doesn't fall), while the other is the actual Fronk. It always falls on the close side of the ledge it falls off of. Also, the place is set in nighttime.